The Matthew Carnahan directed miniseries combines dramatizations of historical events with interviews with many of the figures who play prominently in those events, creating a collage effect which somehow evokes both a history museum and Martin Scorsese’s “The Wolf of Wall Street” at the same time. The series is a powerful juxtaposition between a subject which is at least mostly historical and a style which is completely detached from reality. There are tales of stabbings and DIY oral surgery, plenty of fourth wall breaking and even an interpretive dance. While the surrealism of “Valley of the Boom” is jarring in a series which presents actual historical events, the style is a strong artistic choice for presenting the mood and the people of Silicon Valley during the dot-com bubble. The series is strange because the times were strange. “Valley of the Boom” follows three distinct — though concurrent and interrelated — storylines. The most well known of these is that of Netscape, an early web browser, and its groundbreaking initial public offering. The main players in the Netscape story are co-founder Marc Andreessen, portrayed by John Karna (“Scream”), CEO James Barksdale (Bradley Whitford, “Get Out”) and co-founder Jim Clark (John Murphy, “Loudermilk”). Barksdale and Clark also give interviews, while the real Andreessen declined to participate in the project. 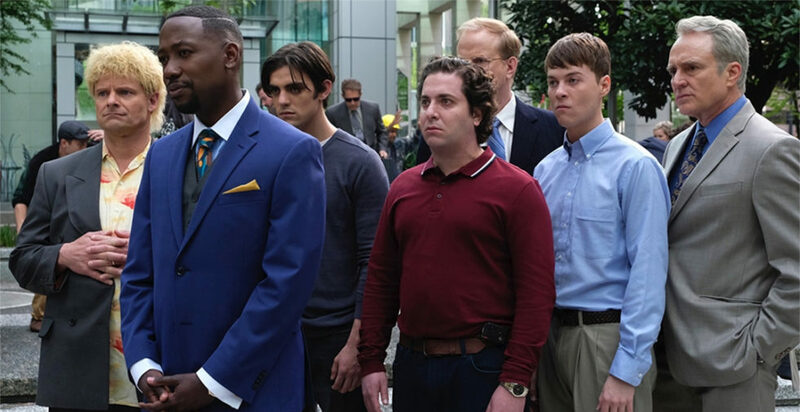 The series premiere and the historical facts of the case set Netscape’s story up as a cautionary tale about the dangers of hubris, avarice and complacency. The story comes together convincingly thanks to Carnahan’s creative use of a variety of visual and narrative effects and Karna’s effective portrayal of Andreessen in all of his calculating arrogance. The Netscape portions are the most entertaining part of the premiere. For those who are unfamiliar with the story of Netscape, the series will likely be dramatic and original, while for those who have historical knowledge of the browser company’s role in the dot-com bubble, much of “Valley of the Boom” will feel like an insightful documentary. The second storyline which “Valley of the Boom” introduces follows theglobe.com, an early innovator in social media. Viewers are much less likely to be familiar with this tale, but the premiere foreshadows heavily that the site will not live up to its potential. Beyond the show’s intentional foreshadowing, it is difficult as a viewer not to expect a negative outcome in every storyline when the series is about a famous economic collapse. Oliver Cooper (“Project X”) and Dakota Shapiro (“The First Month”) portray Todd Krizelman and Stephan Paternot, the founders of theglobe.com. Both deliver solid performances as young, capital-seeking innovators struggling with hesitant investors. Krizelman and Paternot have much more success securing investment after the success of Netscape’s IPO, a plot point which the series uses to demonstrate how the success of a few companies paved the way for riskier projects with weaker business models to become overvalued, thus creating an investment bubble which was waiting to burst. The most bizarre of the three stories told by “Valley of the Boom” is unquestionably that of Michael Fenne. Played by Steven Zahn (“War for the Planet of the Apes”), Fenne is an eccentric, charismatic businessman who helps tech innovators to secure investment by capitalizing on the general excitement around the internet — a technology which few of his investors even know anything about. Fenne is the most surreal of all the characters in the show; Zahn wears an extremely unnatural-looking fat-suit while portraying him, causing him to carry himself in a strange, almost inhuman way. Additionally, Zahn is often framed in front of bright light sources, giving his character a heroically glowing, halo-wrapped appearance which is illustrative of the illusions of grandeur which the historical Michael Fenne was said to have held. “Valley of the Boom” is a show which sets out to accomplish a lot. It seeks to tell the story of how an entire industry ballooned and subsequently collapsed in just a few short years, while also portraying the unique culture and mindset of Silicon Valley in the mid-1990s. It is both a documentary and a drama series. It looks to tell three different yet deeply intertwined stories all at once. If the show is to succeed, it will be due to this ambition. If it fails, that too will be due to this ambition. Based only on the premiere, the series is fascinating, entertaining and interesting. The characters are compelling, the writing is good, and the direction is thoughtful and effective. Still, one could see how after a few episodes, things could go wrong — especially if the plot becomes much more complicated or if new characters are introduced. At the moment, “Valley of the Boom” is in the sweet spot — it has the perfect level of plot complexity, and the perfect number of deep, interesting characters. Viewers can only hope that the bubble does not burst before the end of the six-episode run.